Following a tweet from @lelil about the Carnegie Library Lab project in Scotland I was encouraged to go public about my own research. For several years now I’ve been trying to track down and record all the libraries built in England and Wales with funding from Andrew Carnegie, in particular recording their current status. My connection with these buildings started when I was a child in Kendal, where I remember the stairs to the children’s library on the first floor of the imposing red stone library on the high street. Collecting postcards of libraries has also given a boost to my research, although dealers seldom have a separate section for libraries, which means hours are spent flicking through their geographic collections. Makes it even more valuable when you find something! Having Carnegie as a focus has led to some interesting days out and detours while on holiday, from visiting parts of London I’m unfamiliar with, or collecting 8 in one long weekend in Yorkshire. I always photograph the buildings (click on the tag “carnegie” to filter just the Carnegie buildings) and go inside if they are open. Talking to the library staff has often gleaned useful nuggets of information about the history and boosted my collection by many leaflets, photocopies of newspaper clippings and even books. I once tried to use the power of social media to track down information about libraries and their current status, and was contacted by a handful of librarians who filled in the gaps about some of the libraries on my list. I also contacted the team behind volume 3 of the Cambridge University Press book: A History of Libraries in Britain and Ireland and while they generously shared their background data, I unfortunately misplaced the CDs when I moved house…… Sure they will turn up when I finally unpack all my boxes……. Holidays have often meant stumbling across tiny parts of the Carnegie legacy in unexpected places: Barbados (now unfortunately closed as the stone building is in a poor condition) where I researched my grandad’s landing after being torpedoed during ww2; Dominica where the beautiful wooden building has wide verandas on all sides to catch the breeze, and was bustling and crowded on the morning of our visit, Rheims in Frances, where the stone built library is an Art Deco gem, and Mauritius, where the taxi driver said I was the first tourist ever to ask him to take them to the Carnegie library in Curepipe. 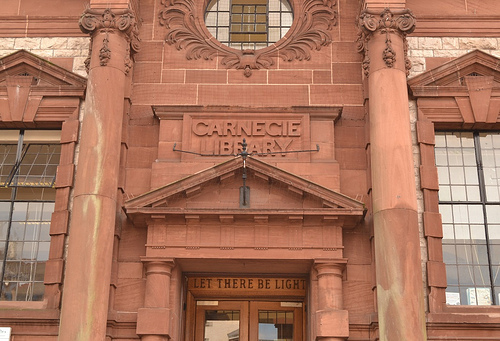 I read Carnegie Libraries across America – a public legacy, by Theodore Jones which gave me a list of the many thousands built there, and have been updating that status list too. I’ve also found websites about the legacy in numerous individual states, plus Canada, a book following a photo exhibition in Ireland, and thorough website listing those in Scotland, but nothing traced which collates the legacy in England and Wales bar a 1970s dissertation (which even being by an alumni of my own college and held by cilip I haven’t been able to see (to their credit, both organisations would have let me visit and consult……but unfortunately that has meant time I haven’t yet had spare)). Hence my own research, which currently sits on my own computer in various folders and documents. The next challenge is to work out a way of sharing this information. Besides publishing my own photos on flickr, I’ve also published some on the Waymarking site, but that template does demand a wealth of information about the location, which I don’t always know. Neither of these options are suitable for postcards, especially those which may still be in copyright. I looked at wikipedia, where there are the bare bones of information, but it would take more wiki-expertise than I posses to turn that list into the sort of resource I have in mind. I attempted a database, but various glitches have meant so far it has not been entirely successful. So, now I’ve heard about the Scotland project, perhaps there is someone out there I can pool resources with? My favourite Carnegie? Those that are still open and in use, perhaps with sympathetic alterations or extensions to make the building suitable for modern use. Also like those that have been put to another use, as museums, art galleries or even just as offices. Saddest are to see those that are boarded up and falling into disrepair, becoming even more familiar with the current round of cuts and closures. Even more important to document and record them while still standing. Finally any of the research projects, whether books or websites, are important to remember those which have been demolished. Before they fade from memory, I think it is important to document the legacy of a man who in his time was richer than Bill Gates, but determined to give away all his fortune.